In J. R. R. Tolkien 's (fictional) legendarium, Dol Amroth was a hill along the coast of Gondor, on a peninsula on the Bay of Belfalas; and also the city that grew up there, mainly in the Third Age as the seat of the principality of the same name. The Prince of Dol Amroth was one of the principal subjects of Gondor. In The Lord of the Rings, Prince Imrahil is the Prince of Dol Amroth, a supporting character in the book's third volume, The Return of the King. Tolkien posits an early population of Elves in this region, specifically at an Elvish haven at Edhelond, somewhat upstream from the mouth of the Morthond, which empties into the sea to the north of Dol Amroth. (Edhelond did not appear on the map issued with the first editions of The Lord of the Rings, but did appear on the revised map first published in Unfinished Tales.) Tolkien's many accounts of the early history describe different sources of this population. In one account, a haven and a small settlement were founded in the First Age by seafaring Sindar from the west havens of Beleriand who fled in three small ships when the power of Morgoth overwhelmed the Eldar and the Atani; the Sindar were joined later by Silvan Elves who came down Anduin seeking the sea. Another account states that the haven was established in the Second Age by Sindarin Elves from Lindon, who learned the craft of shipbuilding at the Grey Havens and then settled at the mouth of the Morthond. Other accounts say that Silvan Elves accompanied Galadriel from Lórien to this region after the defeat of Sauron in Eriador in the middle of the Second Age, or that Amroth ruled among the Nandorin Elves here in the Second Age. Elves continued to live here well into the Third Age, until the last ship departed from Edhellond for the Undying Lands in T.A. 1981. Amroth, King of Lórien from the beginning of the Third Age, left his realm behind in T.A. 1981 in search of his beloved Nimrodel, who had fled from the horror unleashed by the Dwarves in Moria. He waited for her at Edhellond, for their final voyage together into the West. But Nimrodel, who loved Middle-earth as much as she did Amroth, failed to join him. When the ship was blown prematurely out to sea, he jumped overboard in a futile attempt to reach the shore to search for her, and drowned in the bay. The term Dol Amroth (signifying "the Hill of Amroth" in Tolkien's invented Sindarin language) referred originally to a hill along the northern shore of the Bay of Belfalas. It stood on a peninsula jutting westward into the bay, bordering a smaller bay (Cobas Haven) to the north, into which the Morthond flowed. It is not clear how the hill acquired the name of Amroth. Stories recounted of Amroth in Unfinished Tales indicate that he lived at some time during the Second Age somewhere in this area (one account says specifically at Dol Amroth). The name may also commemorate his drowning in the bay; but Unfinished Tales tells of an "Adrahil of Dol Amroth" who lived somewhat before that time. The Faithful from Númenor began colonising the coast near Dol Amroth at the end of the Second Age shortly before Númenor was destroyed, and this area was noted for the number of men of Númenórean blood, and for the number who still spoke the Elvish tongue. By the time of The Lord of the Rings at the end of the Third Age, a city had grown up around the Hill of Amroth and had become the seat of a principality. Dol Amroth is, in fact, the only known principality within Gondor (until the creation of Faramir as Prince of Ithilien at the end of the book), and its prince was an important subject of the kingdom. In The Return of the King, Imrahil, Prince of Dol Amroth, played a major part in the defence of Minas Tirith, and became the effective lord of Gondor during the incapacity of the stewards Denethor and Faramir. The line of Dol Amroth was linked by marriage both to the Stewards of Gondor and to the Kings of Rohan: Imrahil was uncle to Boromir and Faramir; a kinsman of Théoden; and the father of Éomer's wife Lothíriel. The swan-knights of Dol Amroth whom Imrahil led to Minas Tirith formed the largest contingent coming from the hinterland to the defence of the city. 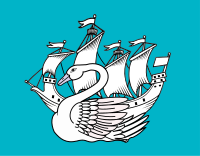 They marched under a banner "silver upon blue", bearing "a white ship like a swan upon blue water". Although The Lord of the Rings never takes the reader to Dol Amroth, some glimpses are provided. Prince Imrahil dwelt "in the great fief of Belfalas ... in his castle of Dol Amroth by the sea, and he was of high blood, and his folk also, tall men and proud with sea-grey eyes". We learn of the city's protective sea-walls. The whimsical poem "The Man in the Moon Came Down Too Soon" in The Adventures of Tom Bombadil tells how the Man in the Moon fell one night into "the windy Bay of Bel"; his fall is marked by the tolling of a bell in the Seaward Tower (Tirith Aear) of Dol Amroth; and he recovers at an inn in the city. The boundaries of the principality are nowhere given, but in addition to Dol Amroth itself, the prince ruled Belfalas (the coast extending eastward) and presumably the area to the east on the map labelled Dor-en-Ernil ("the land of the prince"). Tolkien left two quite different accounts of the House of Dol Amroth. According to an account cited in Unfinished Tales, the Princes of Dol Amroth were descended from a family of the Faithful from Númenor who had ruled over the land of Belfalas since the Second Age. This family of Númenóreans were akin to the Lords of Andúnië, and thus related to Elendil and descended from the House of Elros. After the Downfall of Númenor they had been given the title Prince of Belfalas by Elendil. One branch of their descendants removed to Lossarnach. Morwen Steelsheen, a daughter of that family, married Thengel of Rohan. Through Morwen, both Thengel's heir Théoden and his grandson Éomer carried the blood of the ancient Princes of Belfalas. Adrahil "of Dol Amroth" fought under King Ondoher against the Wainriders. According to "the tradition of [the] house" mentioned in The Lord of the Rings, the line of princes originated from the union of Imrazôr the Númenórean, a Prince of Belfalas, and the Elven-lady Mithrellas, one of Nimrodel's Silvan companions. Imrazôr lived in Belfalas around T.A. 2000 and had two Half-elven children: a boy Galador and a girl Gilmith. Shortly thereafter Mithrellas is said to have vanished in the night. Galador, according to this tradition, became the first Prince of Dol Amroth. Although this account does not appear explicitly in The Lord of the Rings, it figures in the perception of Imrahil by the people of Minas Tirith: "Belike the old tales speak well; there is Elvish blood in the veins of that folk, for the people of Nimrodel dwelt in that land once long ago", as well as in the accolade from Legolas upon meeting Imrahil: "It is long since the people of Nimrodel left the woodlands of Lórien, and yet still one may see that not all sailed from Amroth's haven west over water." Tolkien began, in fact, to work out a genealogical table linking Galador with Imrahil, but he abandoned it after getting little farther than assigning dates to the mostly blank spaces in between. Assassins of Dol Amroth, published in 1987, is an expansion set for the Middle-earth Role Playing game. Dol Amroth and its inhabitants have inspired artists like Ted Nasmith (for the Middle-earth Collectible Card Game) and Anke Eißmann. Dol Amroth is referenced in the name of a rock spire in the Cascade Mountains. It was named so by Dean Wilson, Robert A. Wilson and Allen A. Smith who traversed the area west of Mount Buckindy in 1972 and applied a number of names from The Lord of the Rings to local peaks. Dol Amroth was included in Update 14 ("Paths of the Dead") to Lord of the Rings Online, where it is a major settlement, quest hub, and Reputation Faction. ^ a b Letters, No. 244, p. 323-24. ^ Unfinished Tales, "Galadriel and Celeborn", p. 236. ^ Unfinished Tales, "Galadriel and Celeborn", p. 236-237. ^ Unfinished Tales, "Galadriel and Celeborn", p. 240. ^ a b Unfinished Tales, "Aldarion and Erendis", p. 175, p. 214, note 6. ^ Unfinished Tales, "Galadriel and Celeborn", p. 243-44. ^ a b Unfinished Tales, "Galadriel and Celeborn", p. 240-242, 245. ^ Foster, Robert (1978). A Guide to Middle-earth. Ballantine Books. p. 60. ISBN 9780345275479. ^ Cobas Haven was noted on early maps; see The History of Middle-earth, Vol. VII, "The First Map", p. 312, p. 322, note 10. ^ a b c d e f Unfinished Tales, Introduction, Part Three, II: "Cirion and Eorl and the Friendship of Gondor and Rohan", note 39, p. 316. ^ The Lord of the Rings, Appendix F, "Of Men", p. 407. ^ The Return of the King, "The Pyre of Denethor", p. 127, 131; "The Houses of Healing," p. 138; "The Last Debate", 157. ^ The Lord of the Rings, Appendix A, "The Stewards", p. 336. ^ Unfinished Tales, "Disaster of the Gladden Fields", p. 286. ^ The Lord of the Rings, Appendix A, "The House of Eorl", p. 352. ^ The Return of the King, "Minas Tirith", p. 43-44. ^ The Return of the King, "The Field of Cormallen", p. 231. ^ The Return of the King, "The Houses of Healing", p. 147. ^ The Return of the King, "Minas Tirith", p. 22. ^ The Return of the King, "The Passing of the Grey Company", p. 62. ^ The Adventures of Tom Bombadil, Introduction and Poem 6 – available, among other places, in The Tolkien Reader. ^ Unfinished Tales, "Galadriel and Celeborn", p. 243, p. 255, note 14. ^ J.R.R. Tolkien, Christopher Tolkien (ed. ), Unfinished Tales, "The Battles of the Fords of Isen"
^ Unfinished Tales, "History of Galadriel and Celeborn", p. 248. ^ The Return of the King, "The Siege of Gondor", p. 98. ^ The Return of the King, "The Last Debate", p. 148. ^ The table is reproduced in The History of Middle-earth, Vol XII, "The Heirs of Elendil", pp. 222-23. ^ "Assassins of Dol Amroth". RPGnet. Skotos. Retrieved 11 August 2012. ^ "Princess of Dol Amroth (MECCG)". Ted Nasmith. Archived from the original on 23 August 2012. Retrieved 20 August 2012. ^ "Imrahil tends to his nephew". Anke Eißmann. Retrieved 20 August 2012. ^ Beckey, Fred W. (2003). Cascade Alpine Guide: Climbing and High Routes, Stevens Pass to Rainy Pass. The Mountaineers Books. p. 287. ISBN 9780898868388. ^ "Update 14, The Paths of the Dead - July 14, 2014". "Dol Amroth". The Encyclopedia of Arda. 4 September 2009.